Taurus time brings the time of year that’s good for learning about physical comfort and peacefulness. The Sun leaves Aries and enters Taurus around April 21 each year. This shift takes all of us from fire to earth, from masculine to feminine: Mars rules Aries and insists on action, while Venus rules Taurus and enables attraction. With this changing of the astrological guard, we gain opportunities to focus on our bodies and all other aspects of our material lives. This also is a good time to explore our values, especially in relation to nature and our place within it. When the Sun travels through Taurus each year, it brings an earthy, practical energy that urges us to ground ourselves in material reality. We move away from Aries’s fiery focus on self and taking action to the Bull’s earthy world of physical pleasures, personal possessions, and love of stability. Taurus’s emphasis on the senses allows us to experience our bodies and our world in direct, tangible ways. Sight, hearing, smell, taste, and especially touch teach us about creation’s inherent beauty and inspire us to cherish the gift of a human body alive in the wonder of nature. Combined with Taurus’s love of comfort, they help us sense our physical needs so that we can care for ourselves properly and feel secure and happy. Our senses also teach us the wisdom of moderation and detachment. Although material activities such as eating and drinking can be highly pleasurable, that very pleasure can lead us to overdo; when our bodies feel the discomfort of our excesses, we learn limits and understand that physical satisfactions must not become ends in themselves. Instead, maintaining a strong and healthy body provides the foundation for spiritual pursuits and inner growth and enables us to manage our own lives effectively as well as be of service to others. Taurus is ruled by Venus, named for the ancient Roman goddess of love and beauty. This beautiful planet appears in our sky either just before sunrise as “the morning star” or just after sunset as “the evening star.” When in her evening star phase, Venus is the second brightest object in the night sky, after the Moon. While Earth and the other planets in our solar system rotate counterclockwise (except eccentric Uranus, which rolls along on its side), Venus spins clockwise. As a result, if you could stand on Venus’s surface, you would experience the Sun rising in the west and setting in the east. 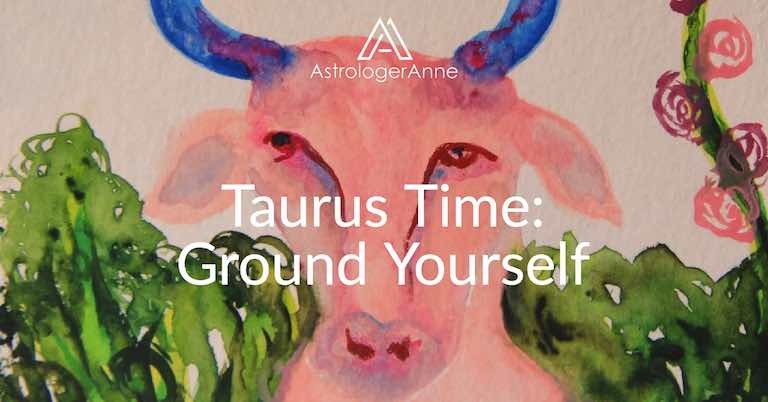 Taurus’s association with Venus gives this Taurus time of year a beautiful, sensual quality. In the northern hemisphere, spring comes into full flower at Taurus time, and color and fragrance abound in blossoming pear and crabapple trees and other spring blooms. This bounty gives rise to Taurus’s association with pastel colors, nature, and gardening and reinforces its status as an earth sign. Its symbol, the Bull, indicates Taurus’s quality as a fixed sign that brings slow, steady energy and dependability. Like the Bull, however, Taurus can bring bad temper, stagnation, or stubbornness if out of balance. Taurus is associated with the neck and throat, indicating the importance of speaking up and telling the truth rather than becoming “stiff necked” out of stubbornness or resentment. During each year’s Taurus time, we feel intuitive impulses to respect our bodies and embrace the home we have upon Earth. Each astrological sign is associated with a phrase, and for Taurus that phrase is “I have.” This energy may be expressed negatively via overspending, accumulating clutter, or even hoarding in order to feel secure. At its best, though, Taurus inspires us to achieve inner security and value spiritual progress so we do not feel the need to amass material riches beyond our true needs. Now is the time to consider what you truly need and what you really value. Already, you have received great gifts in the form of a human body and a human soul, and each day you enjoy nature’s beauty as well as her bounty. You also have valuable resources in the relationships you have nurtured and the love you have accepted and shared. If you will take up the task of extending your love to all beings and all creation, you will come to understand why Taurus’s ruler, the beautiful Venus who helps us attract and be attracted by others, is said to sweeten all that she touches. Tune in even more to the Taurus zodiac sign with the Taurus Meditation.